Tyrone defender Michael McKernan is on the shortlist for Young Player of the Year and he is one of 19 Ulster players nominated for All-Stars. The All-Ireland finalists have seven nominees along with Ulster neighbours Monaghan and Galway. Donegal have received three while Armagh and Fermanagh have one player on the 45-man list. Four-in-a-row champions Dublin lead the way with 12 nominees and the three shortlisted for Player of the Year. Brian Fenton, Ciaran Kilkenny and Jack McCaffrey are vying for the big prize at the awards ceremony on 2 November. McKernan is up against Kerry forward David Clifford and Dublin's Brian Howard for the young player accolade. Padraig Hampsey, Tiernan McCann, Peter Harte, Colm Cavanagh, Mattie Donnelly and Niall Sludden complete the Red Hands contingent. 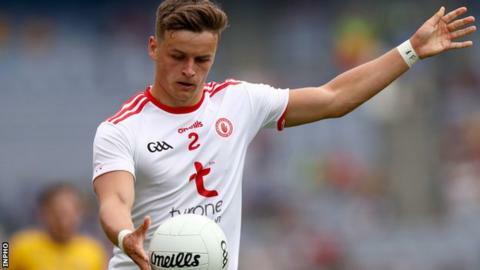 Monaghan lost out to Tyrone in the All-Ireland semi-finals and their seven nominees are Rory Beggan, Karl O'Connell, Drew Wylie, Ryan Wylie, Niall Kearns, Conor McManus and Ryan McAnespie. Michael Murphy, Ryan McHugh and Eoghan Ban Gallagher are the Donegal trio selected while Armagh forward Rory Grugan and Fermanagh's Che Cullen also make the list.